My weekday mornings are pretty consistent. I get Kyri up so she can start getting ready for school. She is able to do most things on her own (get dressed, eat breakfast, brush her teeth), but I just have to be her motivator. Kaden just wants his cup of warm, organic rice milk when he wakes up and he’s good. This mama, however, needs a morning pick-me-up to get her ready for the day. Sometimes a cup of coffee just won’t do. I need something with substance. I came up with the idea of doing a clever combo of my morning smoothie with my cup of decaf coffee. I love bananas and chocolate together so that is where I started. A frozen banana, chilled coffee, and some So Delicious Chocolate Coconut Milk. Can I just say that chocolate coconut milk is simply amazing? So thankful to have it in my life. I also added gluten free oats and chia seeds. Sneaking in those chia seeds again. Yep, I just can’t help myself! They are full of antioxidants and protein. It would also be pretty fantastic if you added a couple tablespoons of nut butter! I discovered this breakfast smoothie can be easily made the night before, placed in refrigerator and enjoyed in the morning. A filling, delicious breakfast in a cup! Add all ingredients to your blender. Blend on high until everything is smooth and blended well, 1-2 minutes. Add additional coconut milk if needed. Serve or chill in refrigerator to enjoy later. « GFAF Expo San Francisco 2013! 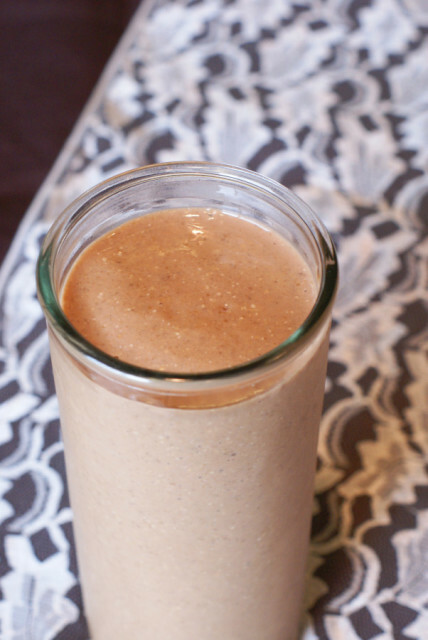 I love how good this smoothie is for you, not to mention that it sounds incredibly tasty too! Omg!!! You are amazing! I LOVE this recipe. I am going to try it this weekend! Thank you for posting such creative recipes. Your site is beautiful by the way! Thank you, Dana! This is one of my favorite smoothies. Such a great start to your day! What would you replace the banana with? I am allergic to them. I know, bummer! So many smoothies use them. 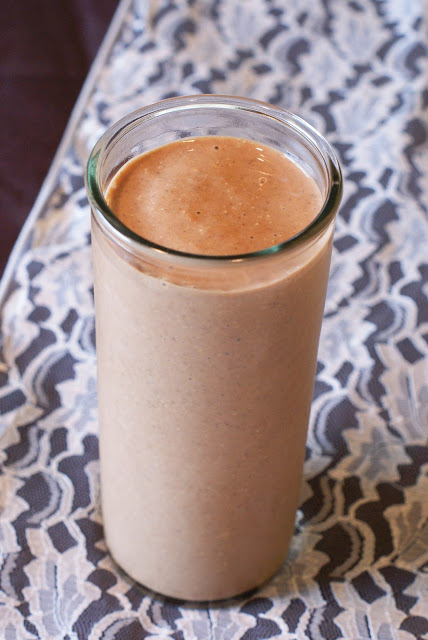 This being a mocha smoothie cannot add another fruit.